Flex-Hone® tools are ideal for robotic deburring operations that can save manufacturers time and money. 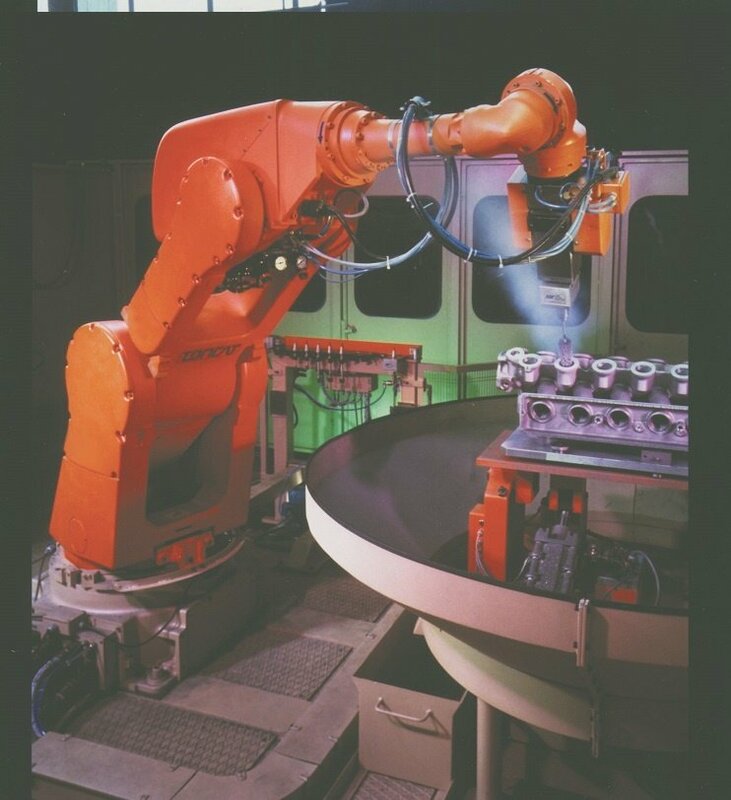 With industrial robots, end effectors grasp the Flex-Hone® by its metal stem wire and rotate the deburring tool according to programmed commands. By combining flexible honing with industrial automation, part manufacturers can combine speed and efficiency with quality, consistency, and accuracy. The benefits of robotic deburring with Flex-Hone® tools don’t stop there. No matter how you use them – with a handheld drill, drill press, CNC machine, or other rotating spindle – Flex-Hone® technology imparts the ideal surface finish to cylinder walls. Flexible hones from Brush Research Manufacturing (BRM) also remove burrs from cross-drilled holes. Let’s take a closer look at why Flex-Hone® tools are ideal for robotic deburring. Small cross-drilled holes can present major deburring challenges. Burrs created during cross-drilling can affect dimensional tolerances, cause part misalignments, and limit the overall efficiency of machined components. For manufacturers, machinists, and metalworkers, surface finishing success begins by choosing the right deburring tools for removing cut, torn, folded, and jagged metal. 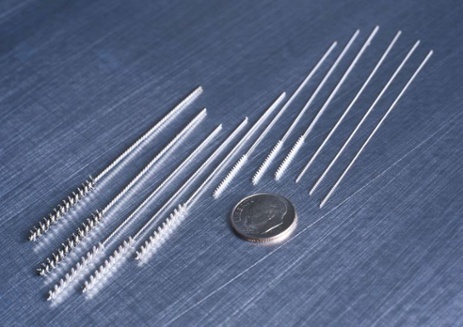 Miniature deburring brushes with abrasive-filled nylon filaments have their advantages, but all-stainless steel tools are especially tough and long lasting. Plus, unlike other types of metal brushes, the filaments of all-stainless steel tools won’t corrode and leave after-rust deposits on finished parts. As a full-line supplier of surface finishing solutions, Brush Research Manufacturing (BRM) has the tools you need for deburring smaller cross-drilled holes. Small-parts manufacturers need tools for deburring, edge blending, surface preparation, and surface finishing. 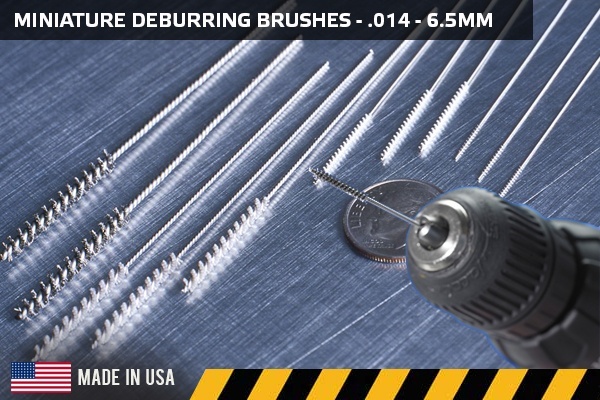 In industries ranging from agricultural equipment to medical device manufacturing, deburring requires the use of high-quality brushes. Manual deburring can affect part consistency, and small-parts manufacturers expect that parts deburred on a Monday morning will meet the same quality standards as parts deburred on a Wednesday or a Friday afternoon. What's the solution?